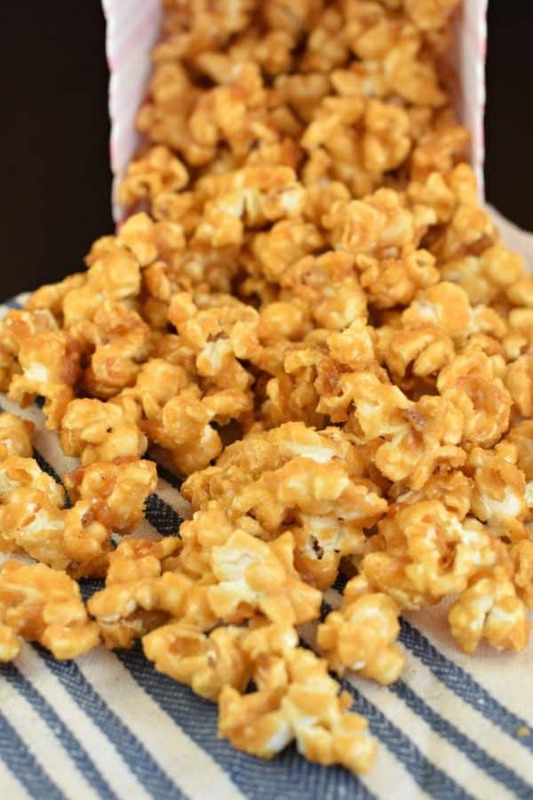 Sweet and crunchy, this Homemade Caramel Corn is the best ever, melt in your mouth treat! Perfect for your next movie night. Being from Chicago, I’m quite particular about my pizza, Italian Beef, and my popcorn. Through over 8 years of blogging, I’ve tried to perfect these Chicago favorites. You can get my recipes for Chicago Deep Dish Pizza and Italian Beef. And now, you can make my recipe for Homemade Caramel Corn. If you’ve ever bought the grocery store caramel corn, you won’t make that mistake ever again. 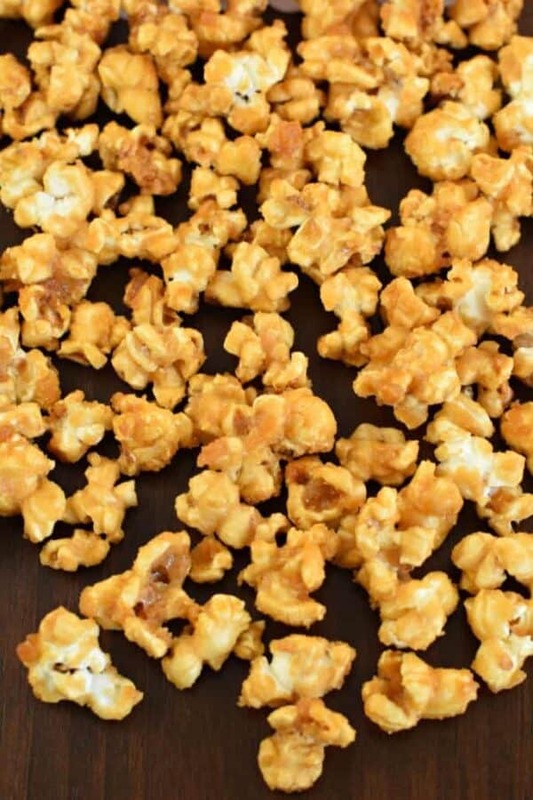 Once you’ve made this melt in your mouth Caramel Corn recipe for yourself, you’ll understand. First you’ll need to start with about 16 cups of popped corn. You can pop it yourself on the stove top, air popper, or you can use microwave popcorn. You’ll need 3 regular sized bags of microwave popcorn for this recipe. For the popcorn, you can use any style you prefer. Whether it’s a light or a butter, you decide. I usually go for the light because this melt in your mouth caramel corn doesn’t need anything extra! Be sure to remove ALL SEEDS (popcorn kernels) after popping your popcorn. Place your popcorn in a large bowl. Set aside. Preheat oven to 250 degrees F. Line two roasting pans with parchment paper. Set aside. Next, in a small saucepan, melt butter with brown sugar, light corn syrup, and kosher salt. Bring it to boil over medium high heat, and boil for one full minute, stirring constantly. Remove from heat and stir in baking soda and vanilla extract. The mixture will lighten in color upon mixing. Pour over popped corn and stir gently with a wooden spoon until all the popcorn is completely covered in caramel mixture. Pour popcorn mixture into two prepared baking sheets. Bake for one hour, stirring every 15 minutes. Remove from oven and cool completely. Once cooled, break apart and store in airtight container or large ziploc bag. Enjoy for up to two weeks. 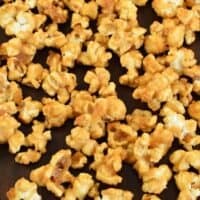 Why baking soda in caramel corn? I add baking soda to the caramel so that it will react with the brown sugar and corn syrup. It creates carbon dioxide air bubbles, making the caramel foamy. Why is this important? The purpose of the air bubbles is to create a softer caramel. You don’t want to bite into a hard caramel. Instead, this results in a chewy, soft, melt in your mouth piece of caramel corn. 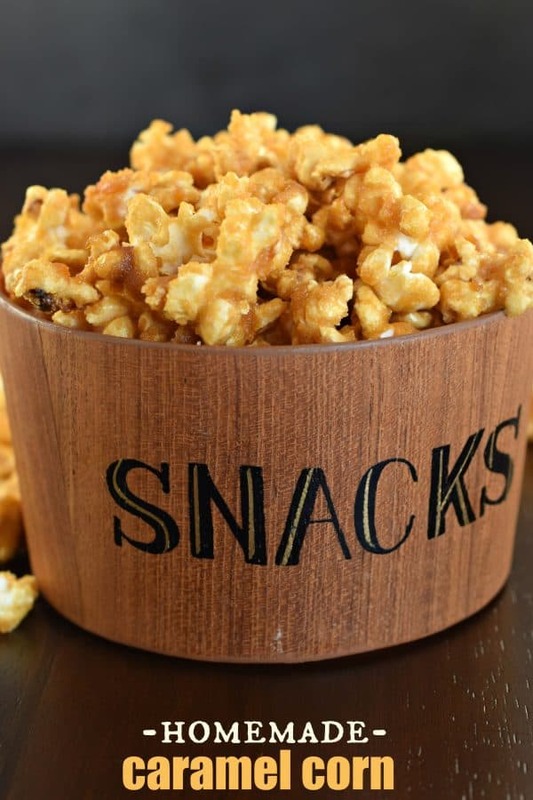 Want to take this Homemade Caramel Corn Recipe to the next level? Add a delicious peanut butter twist! Whip up a batch of this Peanut Butter Caramel Corn with Butterfingers. 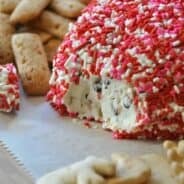 Need a special Valentine’s Day treat? A batch of this Cherry Vanilla Caramel Corn might be the answer. Homemade caramel corn with a white chocolate topping and cherry candy! Imagine all the possibilities when you coat your caramel corn in chocolate? This easy Chocolate Covered Caramel Corn is just the beginning! 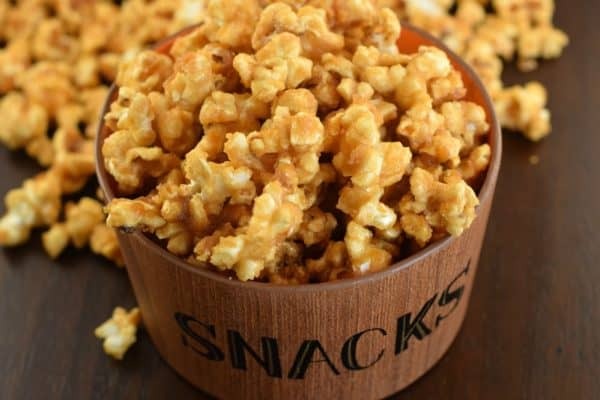 Making Homemade Cracker Jack popcorn is super easy and delicious! 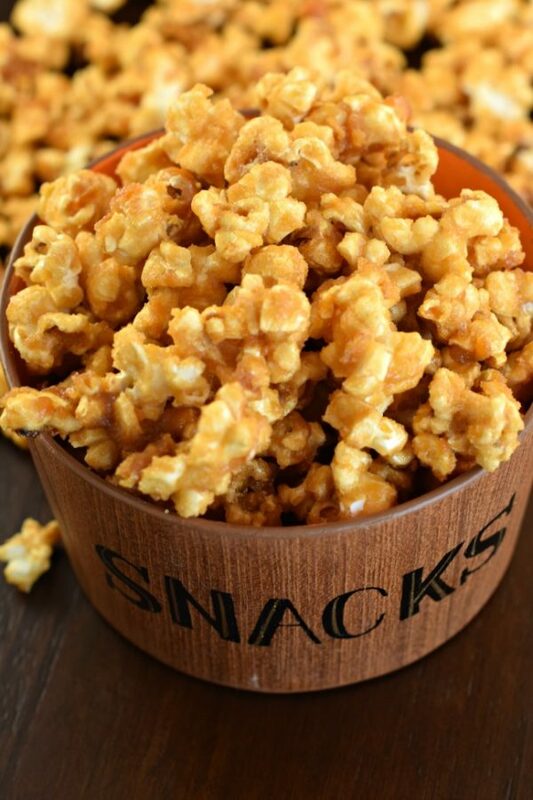 Sweet and crunchy, this addictive caramel corn is better than the original! How long does homemade caramel corn last? At our house, about 2 days. Seriously. I know this makes 16 cups, but it’s addictive. That said, if you pace yourself, and store it in an airtight container, I have found it’s best eaten within two weeks. 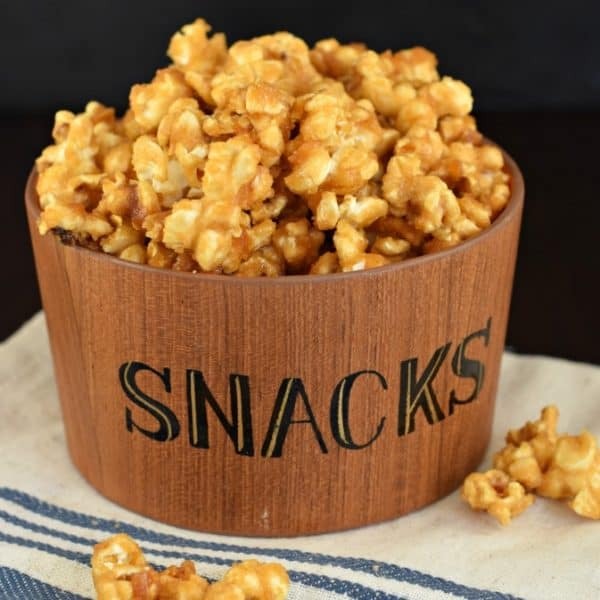 Sweet and crunchy, this Homemade Caramel Corn is the best ever! Perfect for your next movie night. Preheat oven to 250°F. Line two large roasting pans (or baking sheets) with parchment paper. Set aside. In a small saucepan, melt butter. Stir in brown sugar, corn syrup and salt. Bring to a boil and stir constantly. Boil for one minute, then remove from heat. Add in baking soda and vanilla. Stir until foamy. Gradually pour over popped corn. Mix well. Pour into prepared pans. Place one pan on top rack (middle of oven) and one on bottom rack. Bake for one hour, stirring every 15 minutes (and rotating in the oven). Remove after an hour and allow to cool. Store in airtight containers or ziploc bags. ENJOY. **make sure ALL seeds have been removed! 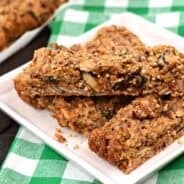 This is the ultimate treat and snack! Homemade is always the best! I absolutely love caramel corn and make it for every trip we take as a nice munchie in the car. I’ve never tried it with the baking soda but now you’ve given me something to up my popcorn game. This would be great Super Bowl party time. This was a hit at movie night! Oh my goodness, this is fantastic!! I could eat the whole thing!! YUM!! This caramel corn is our favorite, we can’t stop making it! My family loves caramel corn! I’m excited to have a recipe for it! I am officially obsessed with this caramel corn! It’s incredible! The whole batch was gone in minutes! 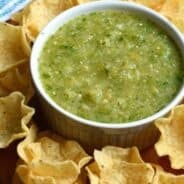 I loved how easy it is to make! Everyone loved it! This popcorn will be a huge hit at my house! Yum! How yo you keep popcorn from clumping from the carmel when you pour and stir it. Once you bake it, you stir every 15 minutes, it breaks down to more individual pieces in the oven.